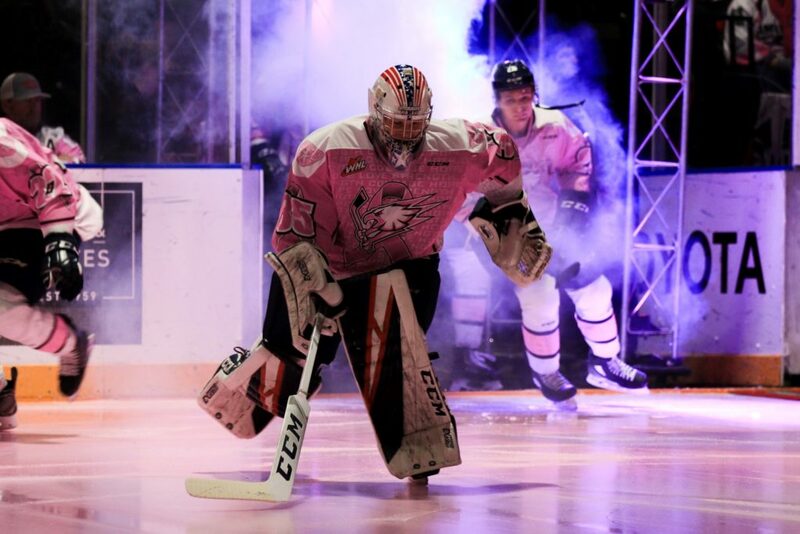 The snow wasn’t going to stop the Tri-City Americans from facing off the Victoria Royals tonight on the Pink Ice for the 14th annual Fred Meyers Breast Cancer Awareness Night. The AMS fell short by 3 goals. Connor Bouchard scored the Americans first goal tonight in the first at 9:23. The boys had a scoreless second period while the Royals were busy scoring 4 out of their 7 goals. The AMS, Will Kushniryk, Riley Sawchuck and Samuel Huo, all scored in the third. Final score: VIC 7 – AMS 4. The Americans will be back home Friday, Feb. 15 to take on the Kamloops Blazers at 7:05 p.m. Buy tickets at the Toyota Center Box Office and online here.